An eight day desert road trip was winding down, leaving just Karl and myself for the final two days. Today we were hiking in the Pinto Mountains, a large, complex range stretching for almost 25mi across the top of Joshua Tree NP. Much of the range has been left outside the park, probably due to mining and OHV interests that have historically used the north side of the range. The Pinto Mountains Wilderness, managed by the BLM, further protects portions of the range in two separate parcels, both adjacent to the park. Our goals today included both the highpoint and the most prominent summit within the Wilderness, separated by about 4mi. We managed to drive Karl's Element to within a half mile of the Golden Eagle Mine where the road ends. Our route would entail a large loop totaling some 13mi, not a bad day's work in desert country. Upon hiking the remainder of the road to the mine, we passed by a Wilderness boundary sign shortly before the road ended in a wash. We scampered across the rocky wash to climb an ill-defined ridgeline 1,000ft to the crest. Along with far-reaching views, we found a large cairn atop the crest, though no clues as to its purpose. It took 45min to reach the cairn but we still had another 300ft and 30min to reach the WPP (Wilderness Prominence Peak), all of it class 2. Nothing of note was found at the top save some nice views overlooking 29 Palms to the north and the Pinto Mountains in other directions. Four miles to the southeast lay the WHP with Pinto Mtn, the range HP, another mile further south. To get from here to there it was first necessary to drop almost all the elevation we had climbed so far. We did this by starting down the SE Ridge, then taking a series of loose, crappy gullies to reach the flatter, sandier wash system below. This was both more interesting and easier, at least until we reached the junction of two main washes, one flowing south and another north, both converging to flow east and then north towards where we'd left the car. As we continued south up the other wash system, we found this one had little sand and far more gravel and rocks that made for unpleasant walking. Ugh, ugh. We endured this for more than a mile before we could finally start climbing out. We ascended slopes to the West Ridge of Peak 3,878ft, a bonus peak between Pinto Mtn and the WHP that seemed a shame to pass up since we'd come all this way. This modest ridge made for far better hiking than the rocky wash we'd been floundering in. 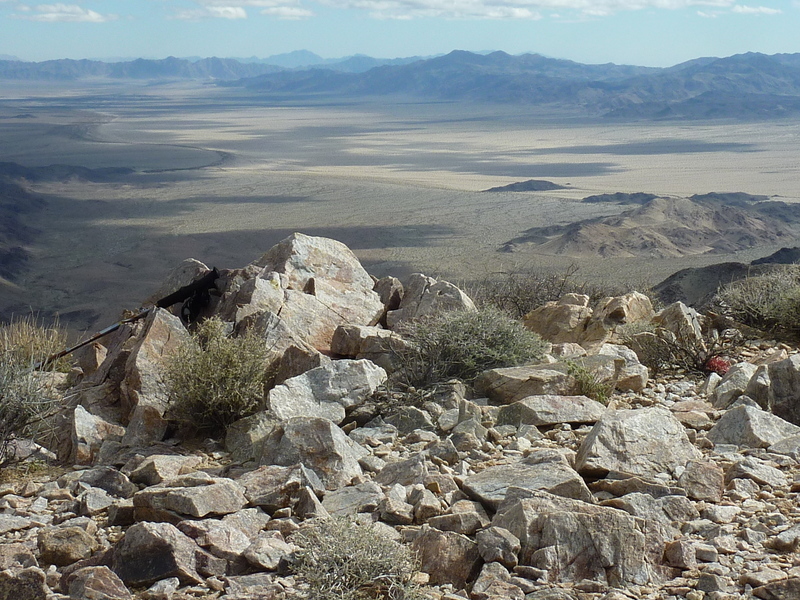 With a bit of weather approaching from the west (and giving us a reason not to dawdle), we reached Peak 3,878ft's summit, marked by a small rock cairn and a great view overlooking Pinto Basin to the southeast. The route to Pinto Mtn along the crest to the south looks like it would make for an easy, fun walk, but we weren't headed that way today (both of us had previously been to Pinto Mtn, approaching from the south. Instead, we turned north and hiked to the nearby WHP only 10min away, separated by a high saddle. John Vitz had left a register at the Wilderness HP in 2012, later visited by two parties in 2015. Further north, fairly strong winds were carrying precipitation eastward, forming a rainbow with blue skies overhead, an unusual sight. Just north of the WHP we passed by a remote instrument that we guessed was for earthquake monitoring but might well have been sending data to our alien overlords. Continuing north down a ridgeline, Karl noted a good-looking summit about 3mi to the northeast. Peak 3,172ft turns out to have more than 700ft of prominence and though not exactly on our way back, it seemed like it might be worth tagging. We followed the convoluted terrain between the two summits trying to minimize our loss of elevation. We got only about 1/3 of the way between the two summits before the threat of actual rain had us losing interest in a diversion that could mean the difference between getting soaked and staying dry. When we found an old mining road heading back towards our start, it made the decision to give up on Peak 3,172ft easy. Though long disused, the old road was still excellent as a footpath and got us down to the main wash heading north. Much sand and gravel filled this wash (along with numerous OHV tracks despite the Wilderness designation) and it seemed to go on far longer than either of us would have liked. It was well after 1p by the time we returned, having gotten only the slightest amount of rain that dried almost as soon as it landed.